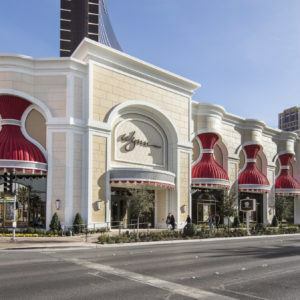 The Wynn Retail Plaza project was a 70,000 square foot expansion to the existing Wynn Resort, consisting of two levels of retail shops, cafes, and restaurants. 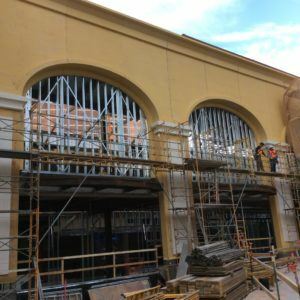 Raymond was contracted by The PENTA Building Group to perform the framing, drywall, exterior insulation and finish system (EIFS), glass fiber-reinforced concrete (GFRC), glass fiber-reinforced gypsum (GFRG), fiber-reinforced plastic (FRP), paint, wallcovering, insulation, and fire-stopping. 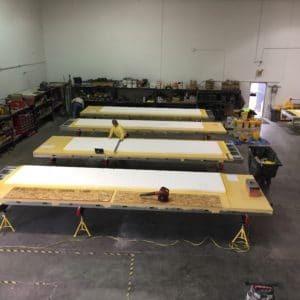 Several prefabrication strategies were utilized on the high-end space to solve complex issues, accommodate site constraints, and meet a demanding schedule. Approximately 57,000 square feet of Sto Panel System was used. Modern materials were used throughout the Wynn Retail Plaza to create a look of masonry. “Block stone” walls were created using 2” foam with reveals and a troweled “travertine” texture plaster with a faux paint finish. The smooth-finished molding shapes were a combination of Expanded Polystyrene (EPS) Foam, FRP and GFRC, depending on location and function; GFRC was used on bases and FRP was used for light coves. Mineral wool was cut and fitted to the back of moldings in order to meet continuous insulation requirements. A challenge on the project was integrating non-visual water drainage systems into the extensive cove lighting on the exterior of the building. This was solved by using stainless steel clips and embeds to create continuous weeps. 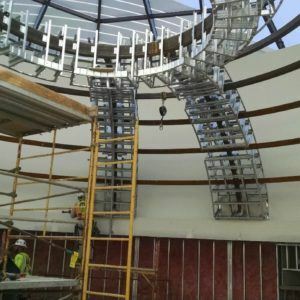 Raymond used a combination of prefabricating exterior backup panels offsite, as well as producing them in place at the jobsite. Radius Track was used for elliptical arch shapes. On the interior of the project, prefabrication was used selectively on storefronts and ceiling arched trellises, where dimensions could be predetermined. 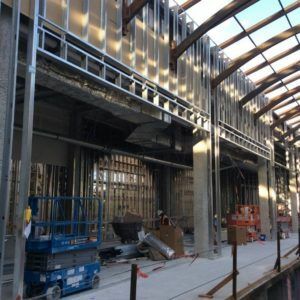 Storefronts were kitted (metal studs were cut to length and bundled per façade) offsite for installation at the jobsite. 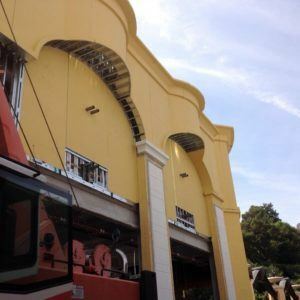 Prefabricated framing components were attached to tube steel arches and dome tube steel. Dome and vaulted trellis areas were finished with GFRG and drywall wraps. 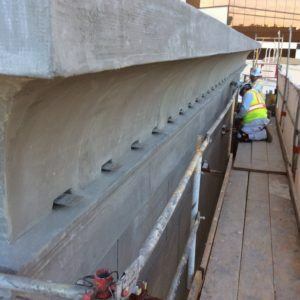 Ultimately, integrating the substrate materials of studs, sheathing, foam, plaster, cast concrete, and fiber-reinforced plastic required innovation, teamwork, and a strict adherence to quality control measures. 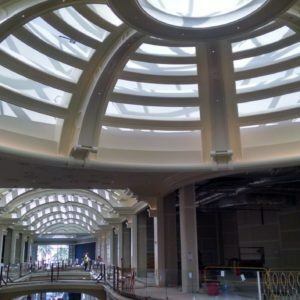 The Wynn Retail Plaza was completed on schedule and budget, with zero injuries.